Major P2P player LimeWire has opened the beta doors to its all-new music store. 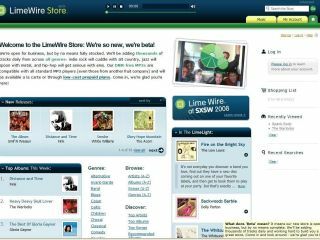 The new LimeWire Store is only available to US customers and operates on either a pay-per-track or monthly subscription basis. There are no major-label artists and the service is limited to independent labels and artists, much like the established independent online music store eMusic. In fact, casting our eye over things we were struck by just how similar the LimeWire artist roster is to eMusic’s, which suggests that the LimeWire Store is making a direct pitch for eMusic’s already established user base. That said LimeWire’s subscription rates aren’t as generous as those offered by eMusic, and LimeWire also lacks eMusic’s strong sense of community. Even if we could, we certainly wouldn’t be tempted into making the switch. LimeWire claims that downloads are encoded in DRM-free MP3 format at 256kbps, and will work with any MP3 player. Although the site is currently in beta mode, LimeWire promises to add “thousands of songs daily”.